These makers of fine organic cheese on Salt Spring Island use the fragrant milk from their own small herd of purebred Jersey cows. They have about 25 cows in total. Depending on the season, they milk between 12 and 20 cows. The cows are treated well as they are the foundation of the company. The healthier and happier they are, the more sweet and fragrant their milk is. 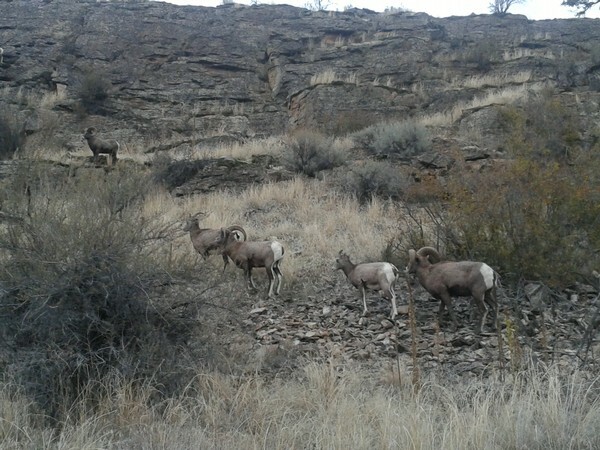 Organic management is used throughout the farm meaning good food, no drugs, no chemicals, free access to the outside world and lots of opportunity to interact socially with other members of the herd. Julia Grace (cheese-maker) and Susan Grace (farm manager) have been producing cheese at Moonstruck since 1998. All of Moonstruck cheeses are made from raw milk in small batches. The job of the cheese-maker is not only to transform milk into cheese but to preserve as much of that fragrant flavour as possible during the process. That is why they use simple, old-fashioned recipes. All of their cheeses develop natural rinds because they believe that good cheese, like good wine, needs to breathe. Pinot Blanc & White Moon: White Moon is a surface-ripened bloomy rind cheese, milder than a Camembert. The easiness of the Camembert works well with the pear and apricot flavours that come through in the Pinot Blanc. The rich mouth feel of the Pinot Blanc compliments the richness of the Camembert. Sauvignon Blanc & Savoury Moon: Savoury Moon is dusted with organic summer savoury following a great tradition from the south of France. The herb infuses the cheese inside the breathable wrapper giving a woodsy, herbal note to the cheese. This herby earthiness marries well with the crisp and clean Sauvignon Blanc. Gamay Noir & Ash Ripened Camembert: This earthy creamy cheese works well with the juicy vibrant acidity that is Gamay Noir. Try it with some savory crackers and a little berry compote. Pinot Gris & Tomme d'Or: Tomme d'Or is a cooked curd cheese similar to the Alpine cheeses of Europe. Made to age long, it becomes a grating cheese when it is over a year old. Made from raw milk, the curd is very slowly heated so that the curds shrink and mat to form a smooth, buttery texture that becomes increasingly firm with age. The nutty flavour of this cheese will lend itself to the Pinot Gris's acidity and notes of stone fruit. Enjoy with a spicy peach marmalade. During the summer months, you can find their cheeses at the Salt Spring Saturday Market and at the Tuesday Farmer’s market from 2-6 pm. The farm store is open Mon-Sat from 11-4pm (but only softly open on Sundays for those who are truly desperate). Although many farmers have completed their harvest for the season, there are still winter markets to enjoy when the weather gets cold. Here are a couple of local Okanagan area markets that run through the holiday season. The items will differ slightly from the summer farmer's markets but there is still lots of delicious baking and local crafts to enjoy! 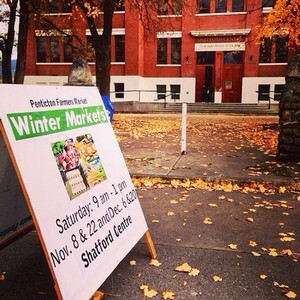 The Shatford Centre is once again hosting the Penticton Farmers' Market Winter Market at the Shatford Centre from 9am to 1pm on the Saturdays of November 22nd and December 6th and 20th. 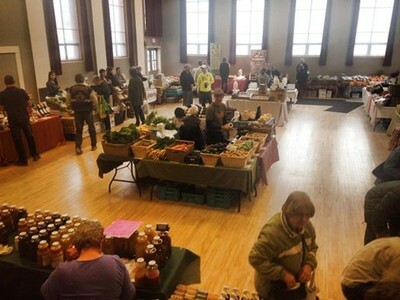 Join them for goods from all around the Okanagan. From fresh baking to vegetables and snacks to crafts, each vendor will have something interesting. Free Admission with a non-perishable food item for the Food Bank. Held Saturdays from 9am-1pm from November to March at the Parkinson Rec Centre. Please note dogs or other animals are not allowed at the market. An ATM is onsite at the indoor market in the hall near the bathrooms. Customer parking is located in the Parkinson Rec parking lot, access off of Harvey Ave or Parkinson Way. A few of our favourite pictures of Fall 2014 at Blue Mountain Vineyard and Cellars, Okanagan Falls. If you have any great pictures of Fall, please submit them to bluemountain@bluemountainwinery.com and we will post them on our facebook page. Join the wineries of Okanagan Falls this holiday season for our open house weekend in the “Heart of Wine Country”! Come visit our 12 wineries for your holiday gifting ideas, food pairings and sample our delicious wines! Join us amidst our decorated wine shops and vineyards while enjoying delicious holiday treats and exclusive features from each winery. 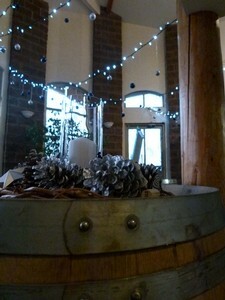 We invite you to come celebrate the season at Blue Mountain Winery with some bubbly and our delicious truffle popcorn. Take part in our photo scavenger hunt for your chance to win a private wine tour for two with Top Cat Tours! 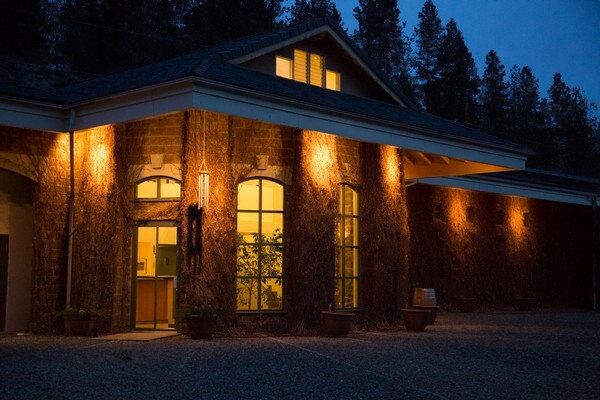 Each winery will open their doors from 11AM to 5PM on Saturday November 29th and Sunday November 30th. Admission is free. Check back for more details on winery features and promotions! Want to book a shuttle for the event? Have a look at our list of tour operators in the area! The Holiday Cheer Open House is one of 5 winery association events that invites guests to spend a weekend in BC wine country! Visit winterwineevents.com for further details on all the winery events from November 29th through December 7th!